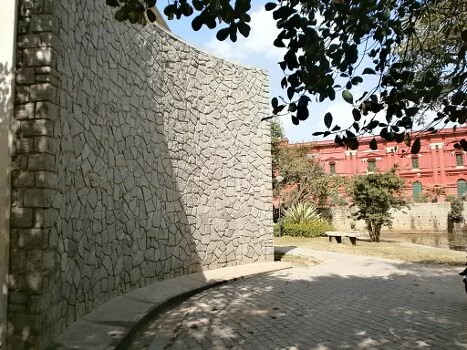 People who love their history might find this museum interesting. They have a collection of artefact’s and objects used by ancient people in this part of the world – They even have some objects excavated from Mohenjodaro site, which is almost 5000 a year old civilization! There are many galleries, each dedicated to some theme like musical instruments, bronze objects, etc all used by people who lived many centuries ago. 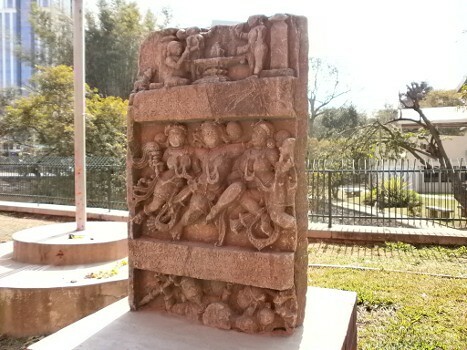 Perhaps the best part of this museum is the visual treat offered by various sculptures from around Karnataka, some of them dating back to more than 2000 years ago. Generally, I find the sculptures in Karnataka very impressive, and the ones preserved in this museum are quite beautiful. If you appreciate beauty in visual shapes and forms, the sculpture section of this museum is a must visit. Photography was not allowed inside the museum, and the one displayed above was taken outside it! 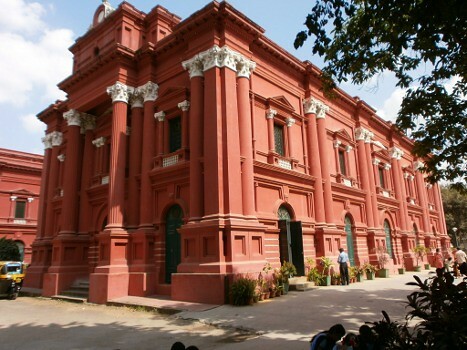 The Venkatappa Art Gallery is located right next to the Government museum building and both the places can be visited using the same entrance ticket. 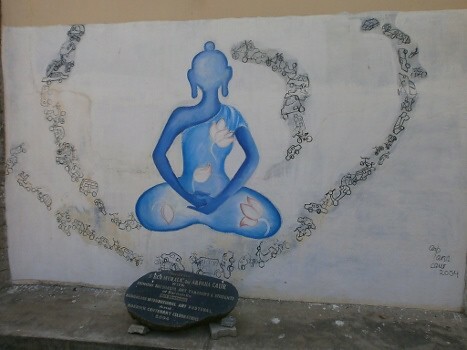 All the art works presented in this gallery were created mostly by an artist called Venkatappa. Looks like he seems to have liked hill stations. Some of the paintings were sceneries of landscapes from Ooty, Coorg, etc. Appadiye enna pannare, camera vai thiruppara. Click !! Un mugathhai naan parka virumbugiren. Enna bayama, photo villa malai potudaporan enru !! Nee pattukku photo eduthukittu poinduerukka, ana un photo ve kanale. Google policy sarimbanna? If you look at the ‘About’ section, you’ll understand why I don’t put up my photo. I don’t want people to associate any article written here to a person (or an image), as I want people to remember only ‘Destination Infinity’ as I want it to become popular. I didn’t even mention my name for the first couple of years, but now I use it in comments section. But most of my readers address me as DI (if you have noticed). That’s the reason. Even my personal Facebook page doesn’t have my photo. It has only the infinity symbol, which you see here. I am so much attached to it, that I want it to become my extended or even only identity on Internet. I loved the painting. If you hadn’t mentioned I wouldn’t have noticed the vehicles surrounding Buddha! This is the reality, they must be showing…the person is meditating within all the chaos surrounding him. Hmmmm, only saints can do that. I had visited Vishveshwarayya museum with my children many years back and what you say is right…it IS stunning. Will try to visit this museum next time when I visit Bengaluru. Waiting to read about the Vishveshwarayya museum. Yeah, the concept of the meditating person in the midst of all that automobile created chaos is interesting. I think every artist should write the inspiration behind their art-work, right next to their painting. That way, we can be sure of the message they want to convey through art. The first picture of that red painted building is awesome DI! And that’s a lovely painting of buddha! when I had gone there, there were two painters sitting beside that water stream and painting the scenery..it was wonderful to watch them.